The Samsung Galaxy S10 Lite may have a simpler camera setup and a smaller flat screen compared to its more premium siblings, but it will use the exact same chipsets. 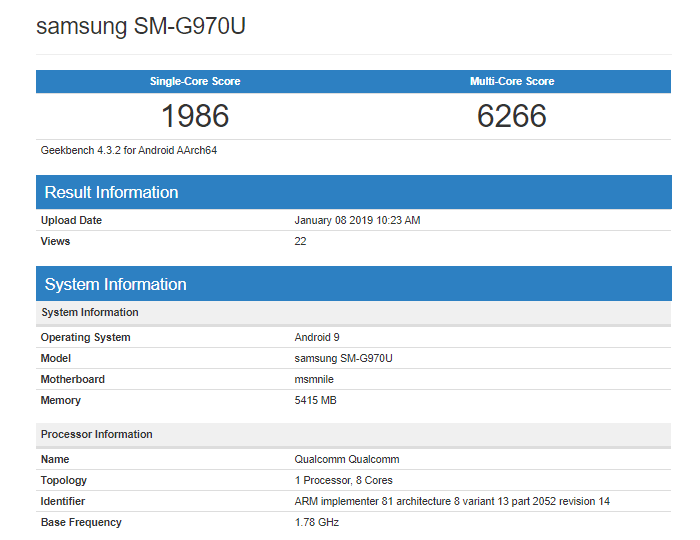 The Geekbench database already contains results from the SM-G970U – the US version of the S10 Lite. It’s powered by the Snapdragon 855 chipset (code named “Nile”) and it packs 6GB of RAM. That matches the 6GB we saw on the Galaxy S10+ (Exynos) when it went through AnTuTu, but obviously there could be several memory tiers. The benchmark score seems pretty low, below what the S845 scores. Seeing that this is a pre-release unit with non-final software we wouldn’t read too much into it. Speaking of, the phone ran Android 9 Pie. The Galaxy S10 phones – a trio of 4G phones plus maybe a 5G model – will be unveiled on February 20 at a special unpacked event and should be available in early March. As for what kind of performance you should expect from a Snapdragon 855, early indications show that it should be faster than the Kirin 980 and Apple A12 Bionic. Of course, there will be an Exynos 9820 version of the Galaxy S10 Lite as well. If apple cheating in benchmark should've been caught long time back not now lol. SD 845 single core higher than that 2420.